Summon: Give a creature +0/+2. Sunhold Medic is a common Willpower creature card. It is part of the Core Set. "You think you can defeat me?" "Tell me where it hurts!" This card's summon ability applies the Medic! card effect. 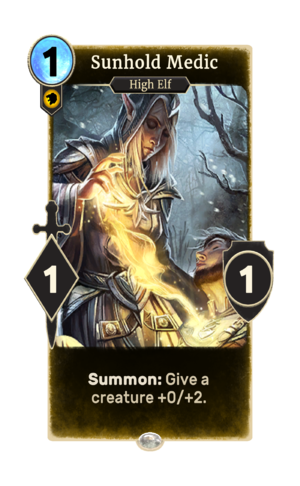 The card is named for the Summerset city of Sunhold. This page was last modified on 15 February 2019, at 12:21.